Researchers at KAUST have developed a method for fine-scale imaging of metal-organic frameworks (MOFs), three-dimensional structures made up of metal ions connected by organic ligands. MOFs are useful for gas storage and separation because they can be designed to have precise pore sizes of molecular dimensions and large void spaces (porosity) within their frameworks. Symmetry-imposed and lattice-averaged HRTEM image of the metal-organic framework ZIF-8 (black and white) with a structural model overlaid to show the position of the zinc ions and organic ligands (in color). Typically, high-resolution transmission electron microscopy (HRTEM) is used to visualize structures with atomic resolution; however, this method is unsuitable for observing MOFs because the electron beams destroy their structures. 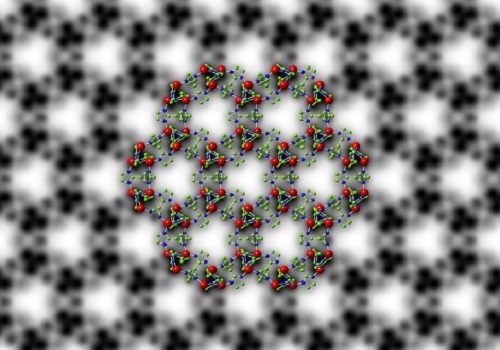 "To thoroughly understand the performance of metal-organic frameworks in various applications, we need to know their structures at the atomic level because their macroscopic behavior is determined by their microscopic structure," explained KAUST Associate Professor of Chemical Science Yu Han. By visualizing these structures, researchers can uncover important clues about how these materials self-assemble to create their trademark pores. Several members of the University's Advanced Membranes and Porous Materials Center, including Han's research scientist and first author of the paper, Yihan Zhu, Associate Professor of Chemical and Biological Engineering Zhiping Lai and Professor of Chemical and Biological Engineering and Director of the Center Ingo Pinnau, joined forces with the University's Imaging and Characterization Core Lab and with colleagues from Gatan, Lawrence Berkeley National Laboratory and others in China. Their collaboration resulted in an adaptation of HRTEM using state-of-the-art direct-detection electron-counting cameras1. The high sensitivity of these detectors enabled them to acquire images with an electron dose low enough that it does not damage the structure of MOFs, allowing the group to produce high-resolution images of their atomic structures. The team applied their method to ZIF-8, a MOF comprising zinc ions connected by organic 2-methylimidazole linkers. They were able to image its structure with a resolution of 0.21 nanometers (one nanometer is one billionth of a meter), a resolution high enough to image the individual columns of zinc atoms and organic linkers. This helped the researchers to reveal the surface and interfacial structures of ZIF-8 crystals. "The results unraveled that porosity generated at the interfaces of ZIF-8 crystals is different from the intrinsic porosity of ZIF-8, which influences how gas molecules transport in ZIF-8 crystals," explained Han.